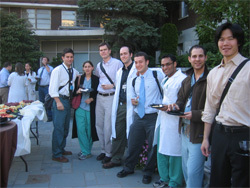 The Staff and Alumni Association is an organization within Montefiore Medical Center, the university hospital of Albert Einstein College of Medicine, supporting Montefiore’s clinical services, education and research programming through alumni programs and services. Whether you are a current staff member or a former resident or fellow, you can continue to support Montefiore’s medical and research efforts and to expand your career network. Our membership base includes medical staff of various career levels and backgrounds, ranging from medical directors to former residents and fellows. Through annual dues and additional contributions, you help to sustain and expand our alumni programs and the services that we offer to the alumni community, such as building an attending physician lounge and expanding our library services. Members pay annual dues to maintain their active status and benefits during the membership year, which is from July 1 through June 30. To join the association and pay the membership fee, use this link.